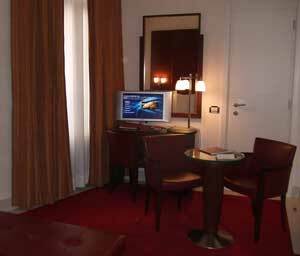 Hotel Palace Bonvecchiati is a modern four-star hotel in the heart of tourist Venice, between the Rialto Bridge and St. Mark's Square. It is a very convenient and comfortable place to stay for Venice first-timers, and the contemporary style will please those who are looking for something a little different. 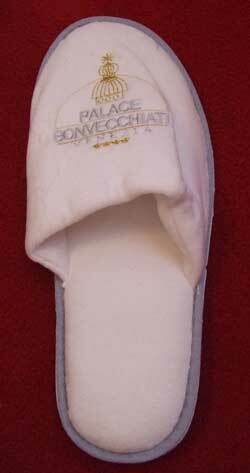 There is a sister hotel, the Hotel Bonvecchiati, around the corner, which is more traditional in style. Palace Bonvecchiati is a smart place to stay, with fairly high prices, but it actually offers some very good room-rates online, especially if you are prepared to wait until the last minute, or pay in advance. I booked a 'superior double room' at short notice in February 2009, for the night before the Carnival. On the Booking website (link below) I found a prepaid non-refundable rate of €110, which was good value for Venice. Our first-floor room was spacious by Italian standards, and looked just as smart as the hotel's publicity photos. The door opened into a wide entrance with the en-suite bathroom on one side and a fabulous walk-in closet with ample clothes-hanging space on the other. I had requested twin beds; these were adjacent to each other, at one end of the rectangular room, with the other end occupied by a small desk and chair, flatscreen TV (with a keyboard for internet access), and a small round table with two chairs. There was a padded seat at the foot of the bed, too. We felt there was plenty of living and sitting space - an important consideration for a longer stay or if you're using your hotel as a refuge during the daytime and not just as a place to sleep. The far wall contained three long windows opening onto a narrow canal. The wall opposite was quite close, but by leaning out of the window I saw atmospheric canal views in both directions. The room's style was bold and modern but not dramatic enough to upset traditional-minded travellers. The carpet was red, fresh and spotless, bedding was white with a red and black throw at foot of bed, furnishings were dark red and wood, with white walls and one modern artwork. Everything was clean and new-looking. The hotel supplied bathrobes, slippers and other handy free items like notepads, pens and a good range of toiletries. A folder contained an A-Z of information with useful telephone numbers for concierge services and assistance. The bathroom was shiny marble and disconcertingly orange. There was a bath with a shower overhead, a stool, good-quality fittings, a make-up/shaving mirror (often overlooked), a wall-mounted hair-drier and even a set of scales (useful for suitcases if you're planning heavy shopping). In the closet area was a mini-bar - it had typical high hotel prices though, so it would be preferable to pop out and do your own shopping nearby. The only negatives I found were the bathroom facilities: the bath/shower did not drain well, and there wasn't much of a barrier to prevent the room being splashed during a shower. Breakfast was in a smart ground-floor room with elegant crockery and flowers on the tables. Uniformed staff seated hotel guests and brought hot drinks. The meal was a generous buffet, with a good range of food, including hot scrambled eggs and bacon. I particularly liked the mini-sized pastries and the fresh fruit salad. There was also fruit juice, cheese, cold meats, cereals, cakes, croissants, rolls and yoghurts - a good, filling way to start a day's sightseeing. All the hotel staff I encountered were friendly, helpful and multi-lingual. 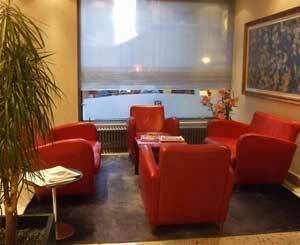 On arrival, the receptionist was efficient, welcoming and informative. He Kept my passport for only a minute or two to fill in the obligatory forms, before a porter took my case and ushered me to my room. When I headed out, he offered a map and some good tips on exhibitions and sights. Althought the hotel was much better than most Italian four-stars, it did charge typically high prices for extras. Internet access is costly, with the cheapest rate for wireless access at (I think) 6 euros an hour or 15 euros for 24 hours. For some reason, at the time of writing it is easier to find free internet access in a cheap budget hotel than in an expensive luxurious one. Room service and the mini-bar too were expensive - not unusually so for a four-star hotel in Italy but a shame, nonetheless. The hotel has a nice little bar where we sampled some decent cocktails, but like most Italian hotel bars it was otherwise deserted. The hotel has a fitness room, and at an extra cost, guests can request massages, beauty treatments and use of the sauna and jacuzzi. There is a lift to reach the different floors of the building, though there are a few steps at the entrance. 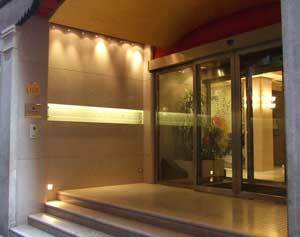 The hotel's address is San Marco 4680 (Calle dei Fabbri). 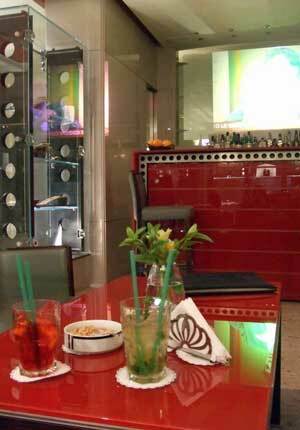 This is an excellent location for sightseeing, between the Rialto Bridge and St. Mark's Square. Each is just a few minutes' walk away. From Piazzale Roma (the terminus for airport buses) the quickest way to reach the hotel is to take vaporetto (ferry) line 2 to the Rialto. From the boat stop it is fairly easy - with a map or directions - to find your way to the hotel, and you only have to lift your suitcases over one bridge. To get there: From Rialto vaporetto stop (lines 1 and 2), turn right along the canalside. After a few yards, turn left between the Goldenpoint shop and the wall-sculpture of Mazzini. Turn right in the little square (Campo San Salvador), taking the lane past the Telecom Italia Future Centre, noting the handsome marble paving stones. Cross one bridge, then take the next lane on the left, which is Calle dei Fabbri. Continue until you reach the hotel on your right. 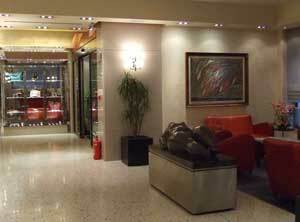 I would recommend this hotel for travellers looking for a central location and an efficiently-run smart hotel. Its contemporary style is refreshing in Venice, though it wouldn't thrill travellers looking for Venetian gilding and flounces. I think it's a shame this excellent place to stay doesn't go one step further to set itself apart from the Italian norm, with free internet, tea/coffee making and lower charges for the bar, mini-bar, room-service and spa. 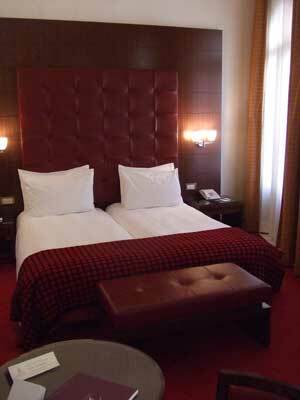 But even without these features, it is still a very comfortable place to stay - some would say luxurious. We loved our room and found the service impeccable. And at the price I paid, it was very good value for money, too. Review by Italy Heaven editor. All the photos are our own and reflect the hotel as we found it.